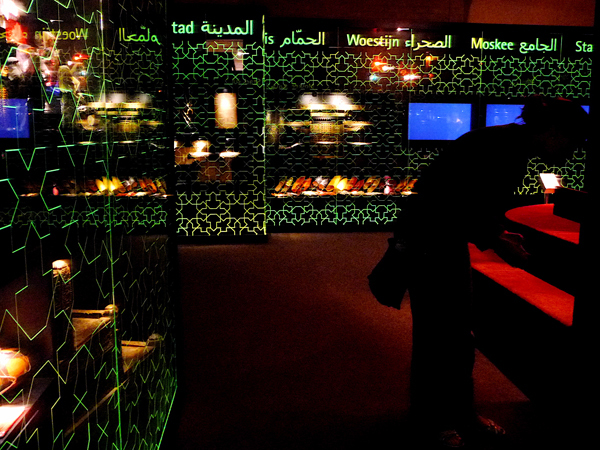 ‘Al Arab, 1001 stories about the arab world’ in Museon, is an exhibition about arabic man: 300 million people in 22 different countries living around the Mediterranean, with a very diverse culture that is centuries old. 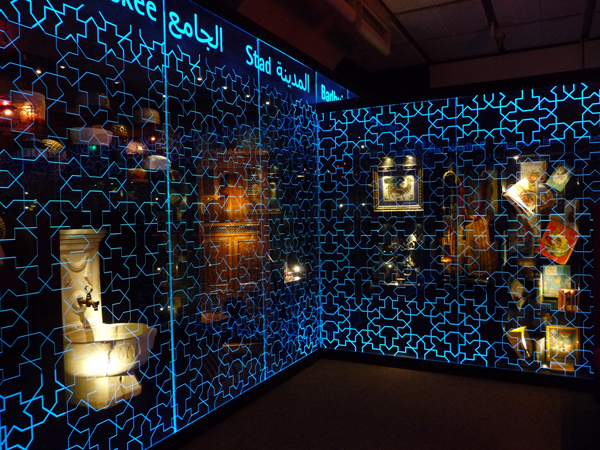 Through several themes, like the mosque, the bath, the desert and the city, the visitor learns about different aspects of het arab culture both in the past and the present. In essence the exhibition consists of a square space, with the bed of Sjarazaad as centre piece. The bed is surrounded by glass walls etched with arabic patterns that change color according to the story told (for example: desert warm colours). From the bed the visitor listens to four different stories supported by video and also by objects suddenly appearing behind the coloured glass. The challenge of this design was on one hand to show as many as possible objects per theme through the total space. 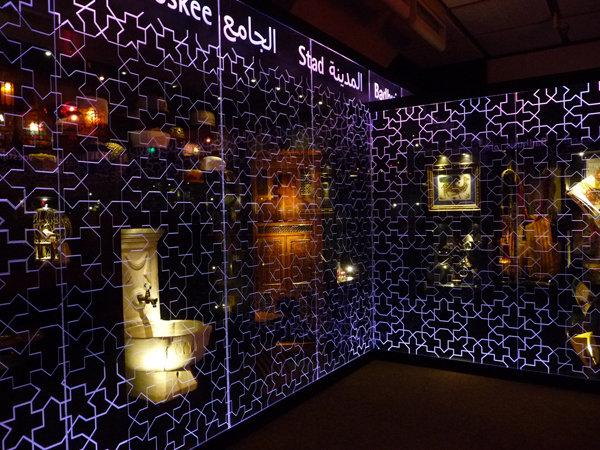 And on the other hand to create a mystical sphere reffering to the stories of ‘One Thousand and One Nights’. 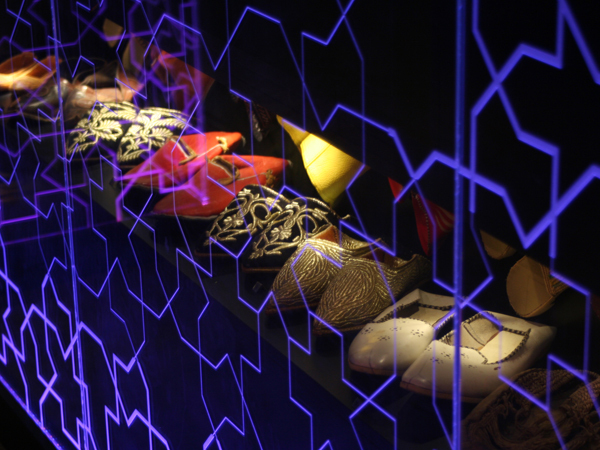 To make this possible the objects behind the glass wall were placed in black boxes each fitted with their own dimmable LED lighting. The objects are only perceived when the lighting in the boxes is turned on. For example during the bath theme only the the related objects can be seen. When the lighting is turned of the objects can’t be seen. To make sure the colored lighting would spread evenly over the total height of the glass, LED strips with RGB and amber were mounted on the top and bottom edges. Also the depth of the edging was deeper in the middle of the glass to ensure enough light was captured. 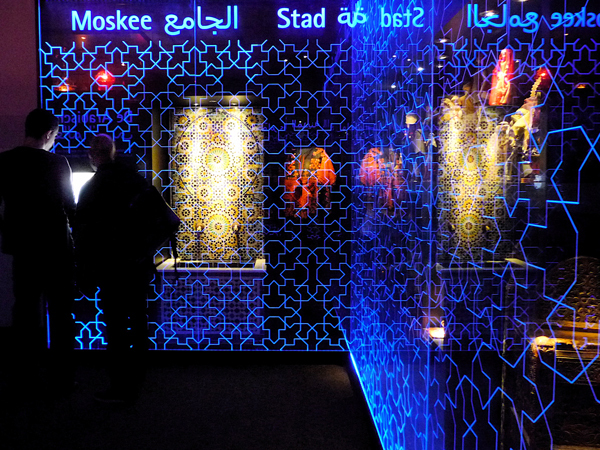 In de tentoonstelling ‘Al Arab, 1001 verhalen over de Arabische wereld’ in het Museon, ontworpen door M2R, speelt licht een belangrijke rol. 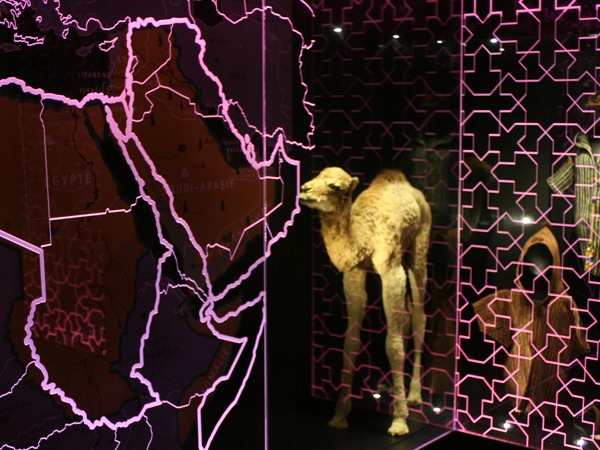 De tentoonstelling laat de bezoeker op een feeërieke manier een kijkje nemen in de kleurrijke arabische wereld. Middels een beeldverhaal worden diverse thema’s zoals woestijn, badhuis en stad aangesneden, waarbij de ruimte per thema van gedaante verwisselt. Achter de glazen wanden met geëtse arabische patronen die per thema en andere kleur aannemen, verschijnen als ware het ‘uit het niets’ objecten die de verhalen ondersteunen.